Lake Bolsena! Get me there! This beautiful tranquil lake near Aquapedente and Orvietto! Shut down the shop 7-11th September 2016! If you love your garden, fruit trees, going bush, absorbing the tranquility of nature and sharing this in a human way? Enjoy the European atmosphere and Italian Scholars. Give yourself a BIG treat! 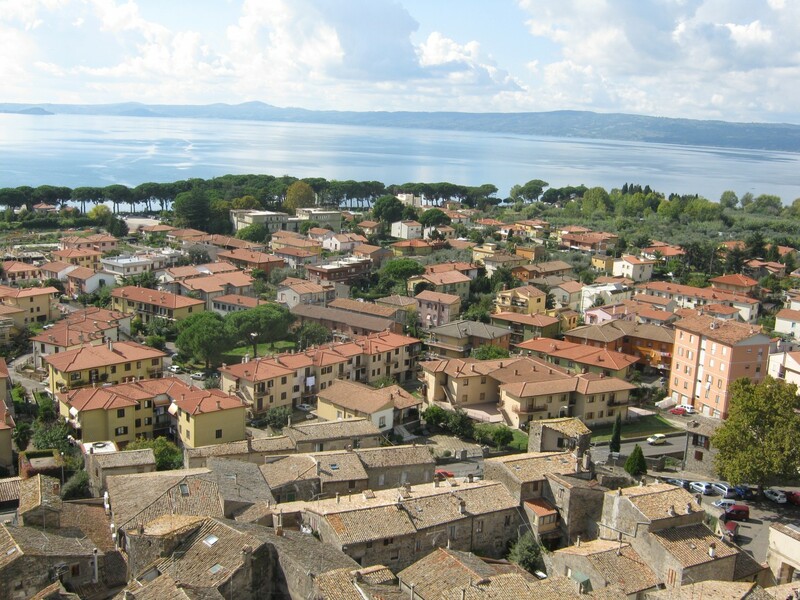 Lake Bolsena is in the region of Lazio near Umbria. 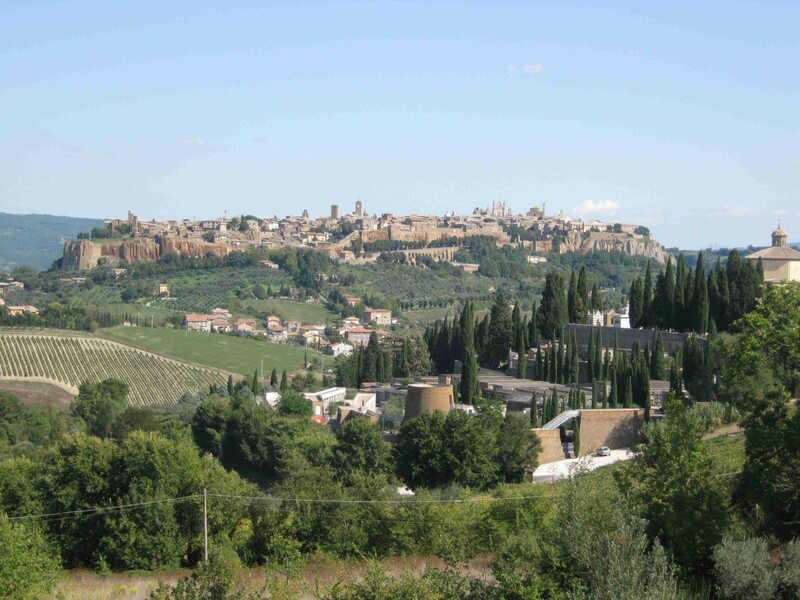 In 2009, we stayed in a farmhouse a few kilometres from Castel Giorgio. The farmhouse stay had 4 bedrooms, a great kitchen and pool. 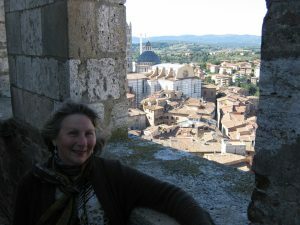 From there we walked to the village of Castel Giorgio where we had coffee and lunch and could shop in the local supermarket with the locals and explore the local landscape, catch a train from Orvieto to Siena and even a day train trip to Assisi. On one occasion while walking out the gates from the farmhouse, I was stopped short by a hissing snake! It went on its way and I wasn’t too worried as there wouldn’t be a highly venomous snake as in Australia, however I was more aware after that as I didn’t want to spend any time testing out the local health system. The owner of the farmhouse had arranged for a local couple in a small village of to cook for our party of 12 in their front room. We were offered local pidgeon and pig and their very own liqueurs. It was an eye opener! We asked the senora to come to our farmhouse to teach us to make her pasta, which she did! We made some great meals in the kitchen, from local vegetables and chicken at the Aquapedente markets (a must see). On Local Hunting – we found that when a car was parked at the side of the road, and/or there were red flags on the roadside trees, it indicated some local hunting/shooting in the scrub. Geoff and our son were walking around the property (they had not entered near the roadside flags) and hurried back as they could hear shots ringing in the bush not too far away and became understandably alarmed. Although we do not advocate shooting, this has been apart of the local way of life and was on the local dining menu. On our last day in early October we dared each other to try a swim as the temperature had suddenly dropped and it felt like and looked like snow was coming. Some took the dare and dived in, but surfaced as soon as they hit the water and were on the edge and out! We had some lovely days for lounging poolside with a book and swimming in late September though. A particularly memorable day was visiting Civita di Bagnorregio in Lazio – an old town isolated on a flat topped tableland (mesa) with a walkway that had periodically collapsed. The mesa was sadly eroding away but it was an interesting look at village life and at how wine was made in the cave like distillery. 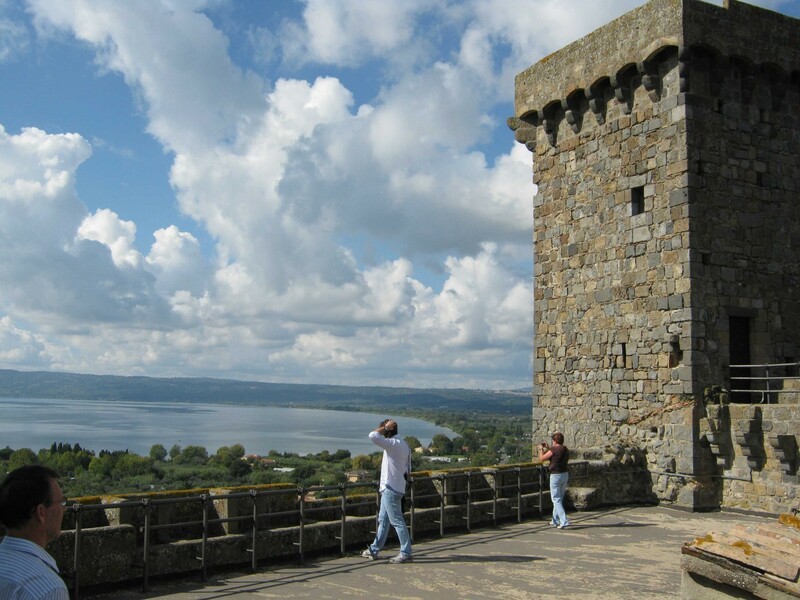 Of course you must see Lake Bolsena. It had the feel of a mini resort down by the Lake and I am sure it is very popular in the Italian summer. The Lake was extremely peaceful with undulating hills cupping the glass like water. It was fit for swimming with few people there in early October and resort like accommodation beside the water. A must see is the view from the Castello above the old town. We took a stunning photo as shown on this page. The Castello has delightful little alleyways to wander nearby. Below the Castello, there were some lovely little shops that our party spent considerable time in buying local jewellery and clothing. In Umbria and Lazio while travelling by car we saw many ruins of small ancient buildings on hills, long since abandoned. Do not forget Orvieto below! Geoff loved the tour of the ancient underground city and we loved walking and eating through the narrow laneways in the current town and visiting the striking Duomo Di Orvieto which was built from 1290 to 1591. another stunning white and black marble Duomo. We would go there again. Orvieto was built high on a volcanic plug. The railway station is below. Geoff and I googled the train connections to Assisi and booked our tickets the day before. We changed at Perugia if I remember correctly (best ask at the station). We had a while to wait on the way back for a connecting train and arrived back in the evening. 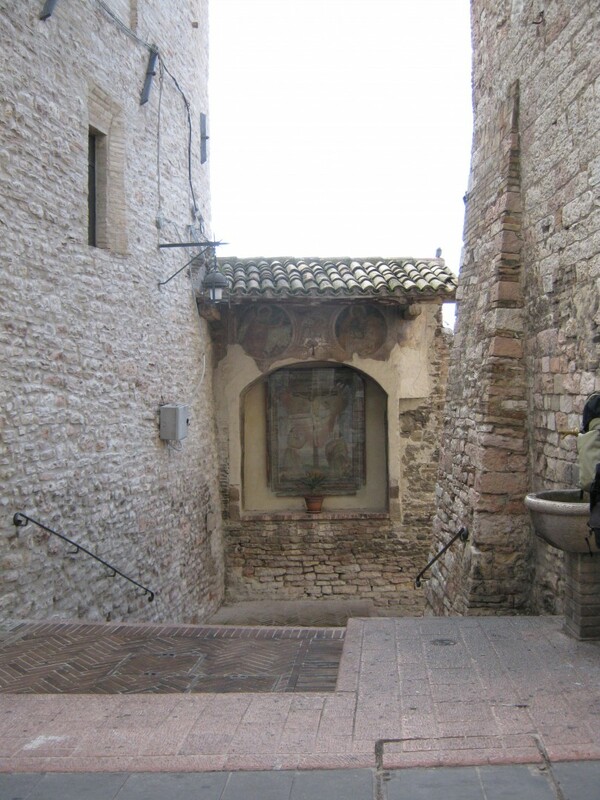 Travelling to the town of Assisi became an unexpected pilgrimage. A sacred site. Phil Cousineau writes “Imagine someone tapping you on the shoulder while you bask in reverie at a strange and marvellous church, mosque, or synagogue. He is whispering in your ear, “where can I find God?” Page 158. I would answer : in Assisi. Although this place is a magnet for the religious, for me Assisi had the feel of spirituality, honouring Saint Francis of Assisi who found humility and social justice after illness and a year of internment during local wars. Saint Francis was born into a prosperous family and after many personal hardships, he entered the priesthood taking an order of poverty. 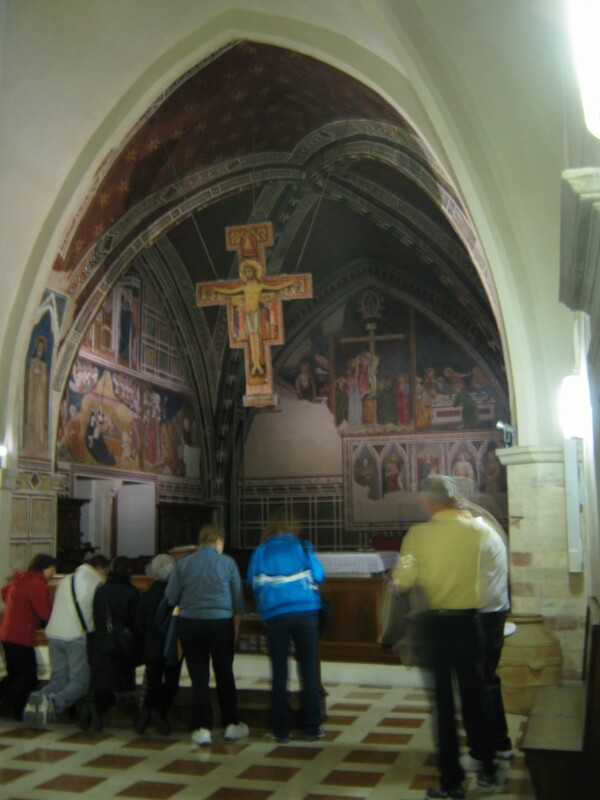 His story is well documented in the Basilica di San Francesco in Assisi. Here I felt like a pilgrim, in awe of St Francis and St Clare, their voluntary hardship and dedication to humanity notwithstanding physical deprivation while empathising with the poor. I was humbled by their place of faith and their work and by comparison my privileged life in 2014. Saint Francis also founded the Order of the Poor Clare Nuns. Basilica di Santa Chiara is in honour of St Clare head of this order of Nuns. Siena is a small metropolis accessible by car or train. We travelled by car and spent the time in the Piazza Del Campo and visiting the Duomo. The Campo has an incredibly tall tower that I faced my fear of heights and climbed with my son. You would not see me doing a Harbour Bridge climb, so this was an exception. The view was stunning. We enjoyed a meal in the expansive Piazza and would you believe that horse racing is part of a biennial festival around the Piazza! It is dangerous and animal activists oppose the race around the Campo. I marvelled at the courage needed to gallop around this vast piazza. 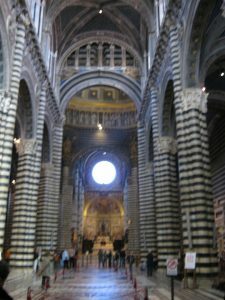 A must see is the stately medieval Cathedrale di Santa Maria or the Siena Duomo built in 1215 and well known for its Gothic Architecture and mosaic floors. This photo doesn’t show or do justice to the colour and amazing black and white marble and floor reliefs. We spent easily an hour or more there. We did day trips by car to Modena and Bologna (3 hours or more one way) where my son and daughter in law where living for several months, an old university town full of history. We had a private tour and tasting of a family’s balsamic vinegar cellar in Modena. It was a cellar passed from generation to generation and of course we all bought a bottle of 75 year old Balsamic – superb. My son and daughter in law learnt Italian in Sydney and were very fortunate in being able to spend time teaching English in Bologna while share renting with local Italians. They remain in contact with their Italian friends and had an amazing year teaching and Wwoof-ing (Willing Workers On Organic Farms). To return to Orvieto, we navigated a motorway and all I can say is I am glad I wasn’t driving. I drive around Sydney no problems, but the motorways are busy, fast and narrow lanes on the opposite side to which we are accustomed. Give me a train trip any day. A two week stay in a farmhouse in Umbria in the Italian countryside was indeed a once in a lifetime event with extended family, one of whom was celebrating a significant birthday and decided this was the place to be! We will cherish the memories. Contact Tanya at TTGolf for your flights and travel insurance and travel suggestions. All our overseas trips have been booked by TTGolf without a hitch!